On a recent (late) honeymoon trip to Galapagos my wife and I spent 7 days in the three main islands. We enjoyed every minute of our honeymoon/vacation and also made it into a birding trip. We experienced a lot of difficulties identifying the finches and became very interested in these thought provoking birds. We manage to identify some of them immediately but it has taken us a few months to gain enough knowledge to try to identify all the pictures of the finches that we took. We are presenting the pictures along with identification characteristics so you can participate in the challenge. We will welcome any suggestions and changes so feel free to comment and we will update the blog to reflect the better judgment or knowledge from other people who will read this blog. These 13 different species of small birds have become the central focus of many studies that help shape human thought regarding our theory of evolution. 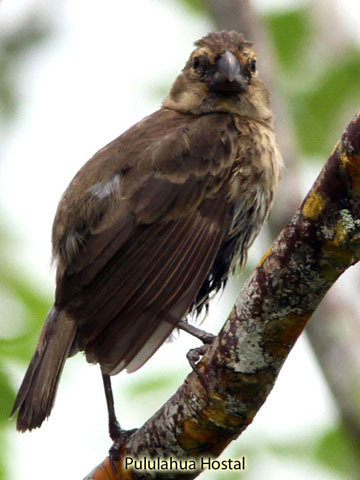 It is believed that all of the Galapagos Finches come from a common ancestor of a dull-colored grassquit (Tiaris obscura) species that came to the islands no earlier than three million years ago. Starting with the family of the Ground Finches there are six species found. 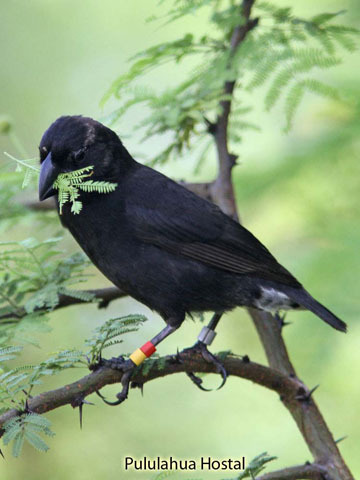 Each finch has adapted to special feeding conditions and has developed different beak characteristics to match. Their beaks are used mainly for crushing seeds and fruit but also feed on insects, buds and flowers. 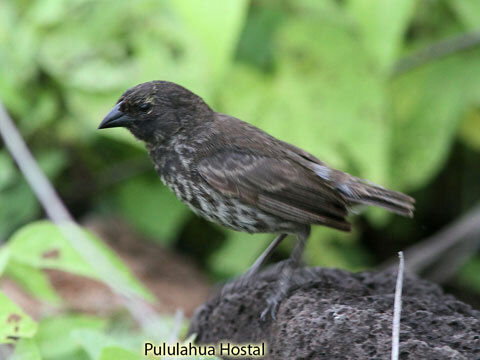 The Large Ground-Finch (Geospiza magnirostris) is the biggest of all the finches (16 cm) has a very large beak used for cracking large seeds, fruits, and a very small quantity of insects. The male is jet black with white under tail coverts and the female is brown with gray underneath and a streaked throat. These finches are not very common and generally found solitarily feeding on the ground. Medium Ground-Finch (Geospiza fortis) is the second biggest of the ground finches (12 cm) with a large beak which is a little more elongated. 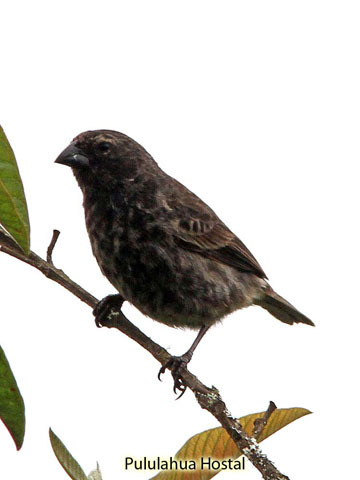 The colors are identical to the Large Finch, are much more common and feed on the ground in groups. These finches feed mostly on seeds, fruits, and a very small quantity of insects. 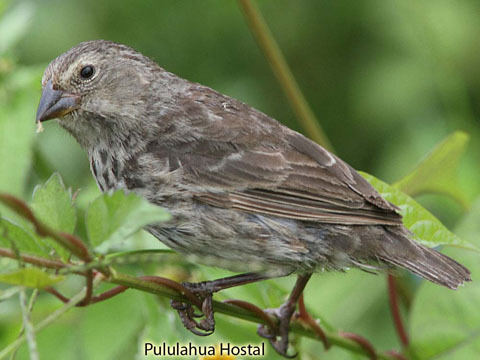 Small Ground-Finch (Geospiza fuliginosa) is the smallest of the ground finches (11 cm) with a shorter beak. His colors are almost identical to the other ground finches; they are very common and also feed mostly on seeds, fruits, and a small quantity of insects. Sharp-beaked Ground-Finch (Geospiza difficilis) is also a small finch (12 cm) with a longer beak than the Small Ground-Finch. His colors are also the same as the others but these are not as common only appearing on some islands. 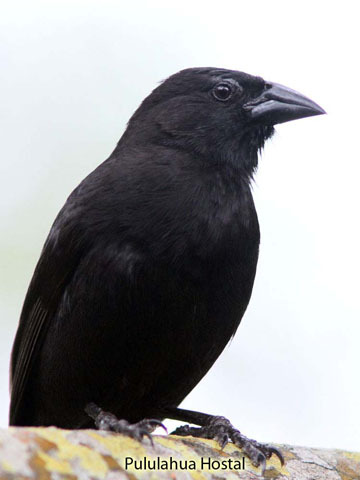 It is known that these finches in the islands of Darwin and Wolf have developed a special behavior that has given them the name of Vampire Finches. 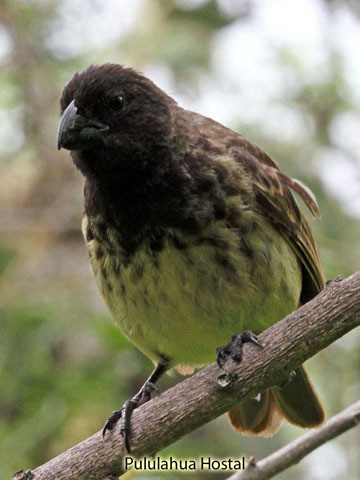 It has been observed that these finches will peck at the Masked Boobies in search of lices and draw blood which they drink. 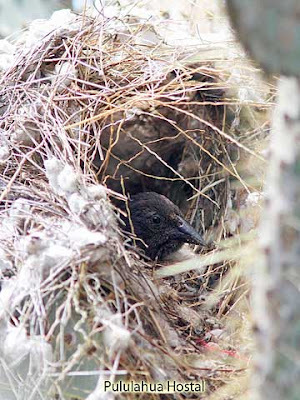 These finches also steal the eggs by rolling them until they break to drink their contents. 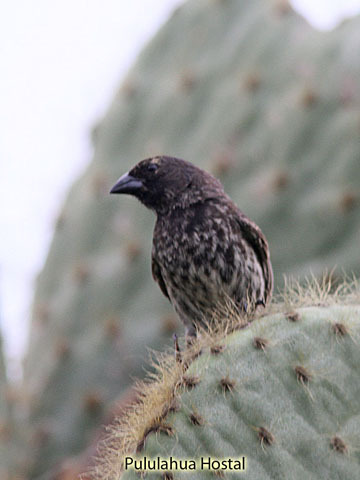 Common Cactus-Finch (Geospiza scandens) is a large finch (14 cm) with a very long and slightly curved beak . 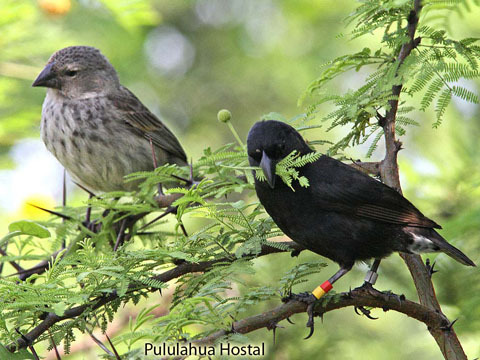 The male is black and the females have brown streaks with a gray belly. 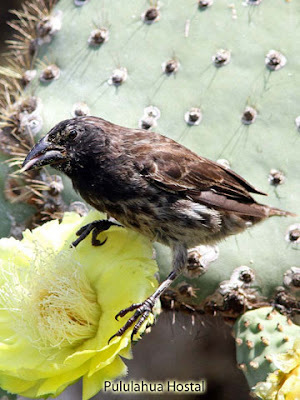 These finches are very common and can be easily found perched on a cactus pear flower digging for the young cactus pear that lies underneath the yellow flowers. They also feed on seeds, fruits, and insects. 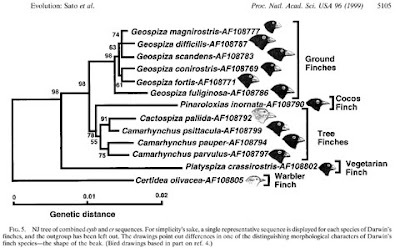 It seems that the Common Cactus Finches from Sata Cruz have longer beaks! Large Cactus-Finch (Geospiza conirostris) is a large finch (15 cm) with a large beak that is not curved or as long as the other cactus finch. It is not very common and can only be found on Española, Genovesa, Dawin, and Wolf. He can also be spotted on the cactus pear flowers but also feeds on seeds, fruits, and insects. 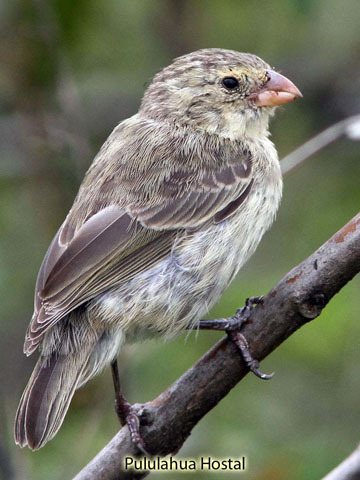 The tree finches are a second subcategory found mostly on trees and their diet include a large percentage of insects. Most of them have a dark brown back with a gray head and white or streaked breast. Their beaks are sharper than the Ground finches and described as a grasping bill with biting tips. 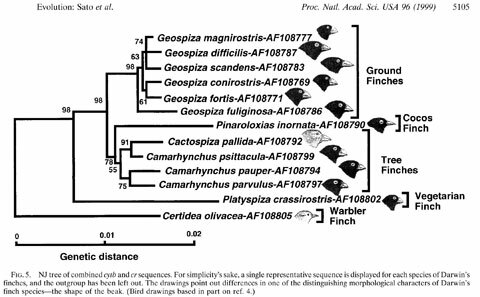 Each one of these finches have highly specialized beaks that have adapted to the local conditions that have forced specific speciation. 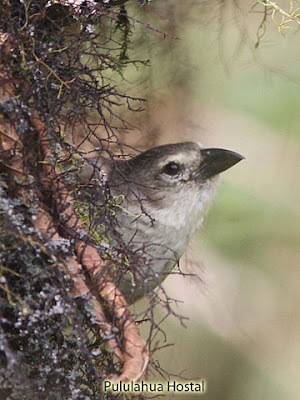 The Woodpecker Finch (Cactospiza pallida) is a very large finch (18 cm) with a pale gray underside and an olive brownish back, there is no sexual dimorphism. The beak is very long, curved, and sharp. Its peculiar ability is to use a small twig as a tool to dig grubs out of their hiding spots; the tool is a compensation needed for having a short tongue. Studies have determined that these birds will use the tool to obtain as much as 50% of their food. Mangrove Finch (Cactospiza heliobates) this is the most threaten finch and it is currently on the Critically Endanger List (http://www.iucnredlist.org/apps/redlist/details/150298/0 ) due to predation from black rat (Rattus rattus), feral cats and Smooth-billed Any. 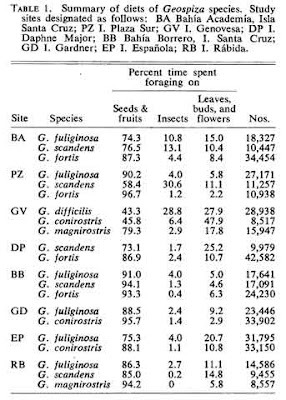 Also there are problems with parasites such as Philornis downs which is a fly that was introduced accidentally into Galapagos. The flies lay eggs on the nest and the blood sucking larva feed on the nestlings. 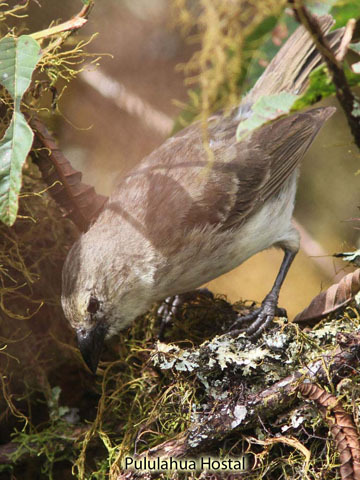 It is a medium finch (14 cm) with a long beak similar to the Woodpecker Finch but a little thinner. 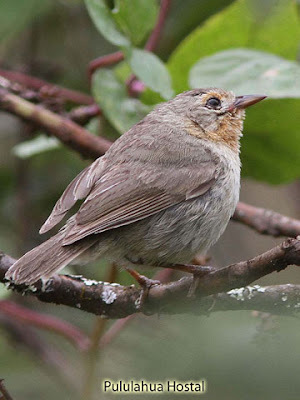 There is no sexual dimorphism and have a brown back with a pale gray belly with streaking towards the breast and throat. 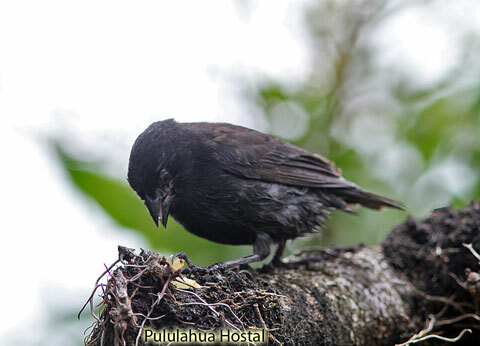 Large Tree-finch (Camarhynchus psittacula) is the largest of the tree finches (15 cm) . 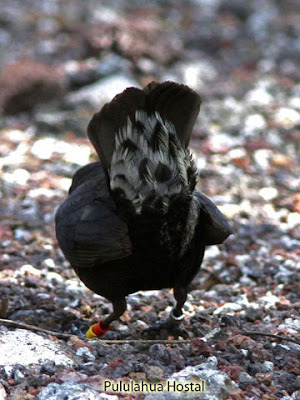 The male has a black head and breast forming a black hood like appearance with a yellowish belly that has streaking near the breast. The female has a olive-green plumage with a lighter yellowish belly. The beak is a powerful thick and curved beak resembling that of a parrot. They use this strong bill to tear bark in the search of insects and grubs which constitute the bulk of their diet, although they also feed fruit during the dry season. Medium Tree-finch (Camarhynchus pauper) is a small finch (12 cm) endemic only to Floreana and also on the Critically Endangered List (http://www.iucnredlist.org/apps/redlist/details/150295/0) It is threated by Philornis downs which is a fly that was introduced accidentally into Galapagos; the flies lay eggs on the nest and the blood sucking larva feed on the nestlings reducing reproductive success. There is sexual dismorphism showing differences of color on their heads but the rest of their body is mostly grayish-brown with light yellowish underparts. The males has a darker head, neck, and upper breast while the female head color matches her back with the grayish-brown. 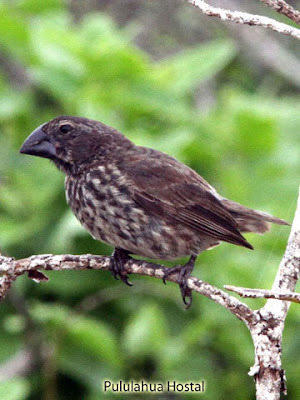 The beak could be described as a hybrid of the Large and Small Tree-finches. 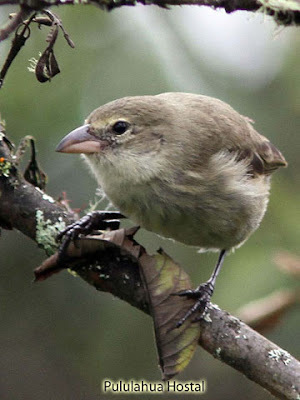 Small Tree-finch (Camarhynchus parvulus) is the smallest (11 cm) tree finch with a short curved beak. The underparts are gray and yellowish on both sexes but the male has a blacker darker head and shoulders. His beak allows him similar functions as the Large Tree-finch only on a smaller scale; he is considered an insect specialist but can consume fruit seeds and nectar during the dry season. 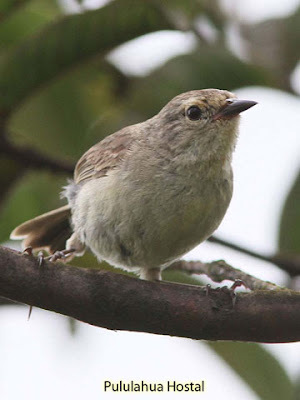 Warbler Finch (Certidea olivacea) is the smallest finch (10 cm) and is the most widespread finch of the family, it is found on all the islands. This bird has a melodic song much like a warbler and his name follows his singing reputation. The back can vary from olive green to gray depending on their habitat, the underparts are mostly light buff and some males have an orange throat-patch. They feed mostly on insects while probing with their thin beak. 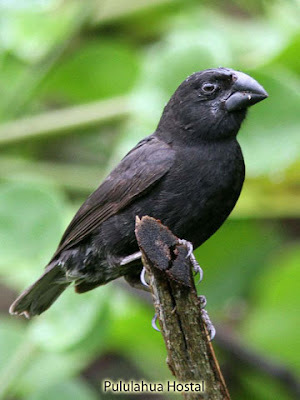 Vegetarian Finch (Camarhynchus crassirostris) is a very large finch (16 cm) with a very strong beak and curved resembling that of a parrot and very similar to the beak of the Large Tree-finch, except the Large Tree-finch has a curved bill on the top and on the bottom parts. This finch feeds mostly on plants including fruit, flowers, seeds, nectar, and occasionally and insect. The male has a black back and head and yellowish underparts with some streaking. 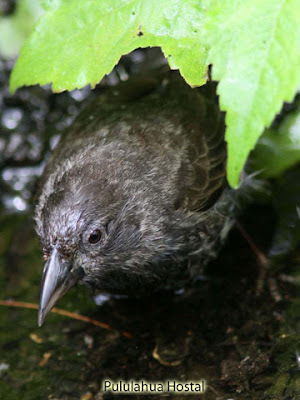 The females have a brown back and head while their underparts are gray and light yellow. The Cocos-finch (Pinarolxia inornata) is endemic to the Coco´s Islands which are located 600 km northeast of the Galapagos Islands. It is a small finch (12 cm) where the males is mostly black and the female is brown with lighter streaked underparts. 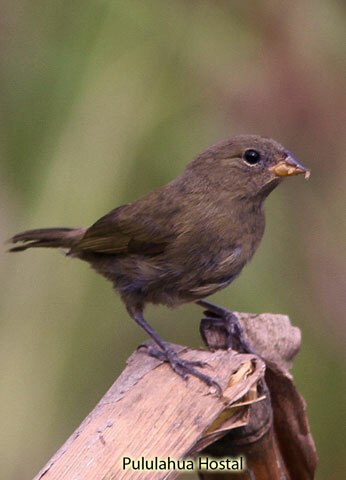 This finch has a more diverse diet and is not a specialist like most of the other finches. Please feel free to help me identify any of the above pictures.